There’s something familiar about the time machine in the latest Justice League/Power Rangers crossover comic: In the latest issue of the series, the superheroes gather at the mouth of what seems to be the Large Hadron Collider, Geneva’s massive particle accelerator, discussing how to use it to jump across universes. While the thought of using CERN’s masterpiece to open up portals to other dimensions seems to be a purely fictional conceit, the heroes aren’t the first to propose it. Real-life Vanderbilt University physicist Tom Weiler, Ph.D., dreamed it up first. In the comic, a scientist explains the heroes’ theory like this: “The idea is, if we smash the particles together in the right way, we can open a door, just for a fraction of time, into another universe.” While it’s a bit vague on the details, it’s actually similar to a theory that Weiler introduced in 2011. According to Weiler and then-graduate fellow Chui Man Ho, if the Large Hadron Collider succeeds in smashing particles together hard enough to create the elusive Higgs-Boson particle, a side effect of the reaction might open up a fifth dimension, thus allowing a form of time travel, at least for certain particles. We’re not too sure what exactly the relationship between “universes” is in the world of DC Comics, but Weiler’s theory certainly raises the possibility of crossing dimensions, which seems to encompass what the heroes are looking to do. CERN's Large Hadron Collider figures prominently in a recent Justice League/Power Rangers comic. The Higgs-Boson particle is the final, elusive piece of the universal puzzle described by the Standard Model of Particle Physics, which is the best theory we’ve got for understanding the universe and all the particles and forces within it. Scientists theorized that smashing together particles — protons and lead ions — at a velocity near the speed of light would produce the Higgs-Boson, and it did, in 2012. But Weiler and other researchers studying an advanced, all-encompassing theory called M-theory believed that reaction could also produce something else — the Higgs singlet — which had the power to travel back and forth in time. The Large Hadron Collider storyline is in issue #3. M-theory, a “theory of everything,” proposes that there are ten or eleven dimensions rather than the four that we’re aware of. It also predicts that, while most of the building blocks of the universe are stuck in the basic four dimensions, a few particles aren’t. The Higgs singlet — which, Weiler thinks, is created at the same time as the Higgs boson — is one of those particles. In the fifth dimension, which doesn’t follow conventional rules of time, it can move backward and forward in time to reappear in the future or past. The Higgs singlet, which might be created at the same time as the Higgs boson, would have the ability to travel through time. 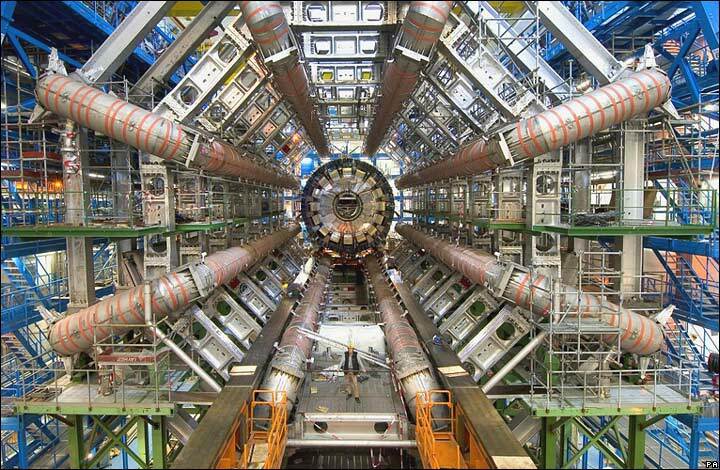 To test this, CERN researchers would have had to look out for the singlets and their decay particles while seeking out the Higgs Boson; if they appear, “they will have been produced by particles that travel back in time to appear before the collisions that produced them,” a statement on the theory explained. But this might be all the time travel capability the Power Rangers really need: The whole reason the Power Rangers are looking to travel through the Large Hadron Collider is because their “communicators,” which allow them to communicate with their own dimension, are broken. If their issues come down to a matter of cross-dimension messaging, Weiler’s theory is actually quite useful — and much less risky than attempting to transport people across dimensions in one piece.